When the ease of construction and maximum insulation matter then the Double Module System comes into its own. 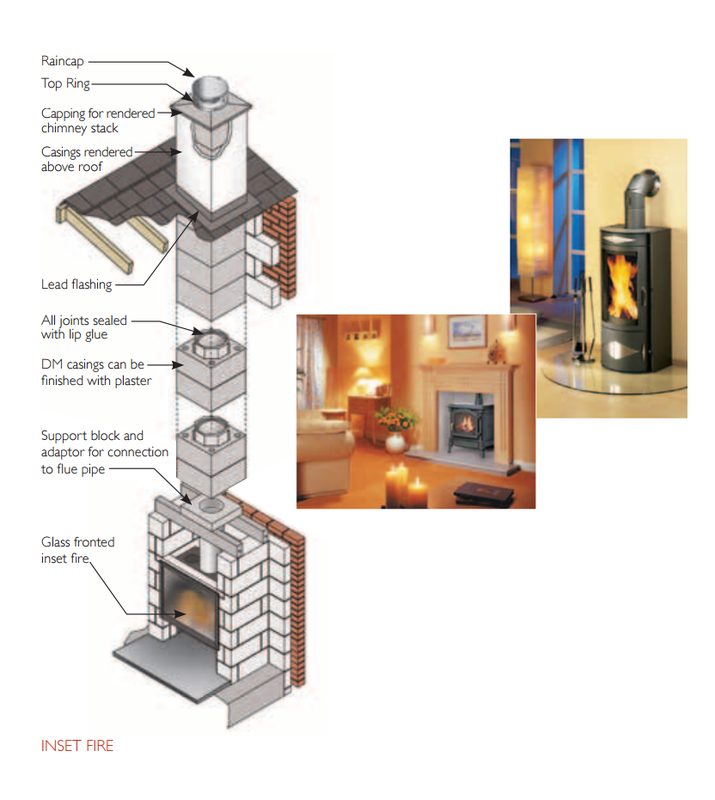 This chimney system is designed to be quick and easy to install. The lightweight blocks are easy to handle. The outer and inner blocks are laid at the same time but with staggered joints for safety and stability. The double layer of pumice separated by an air gap maximises the chimney insulation. 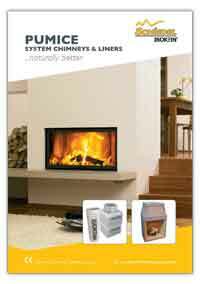 The Pumice chimney systems are suitable for wood logs, solid fuel, oil and gas (not suitable for condensing appliances). Click here to contact us (telephone or send an email) for more information and to request a brochure via post. 300mm and 345mm internal diameters for Magnum fire chests, larger appliances and open fires. DM 36 is designed for smaller output inserts, stoves and cookers. 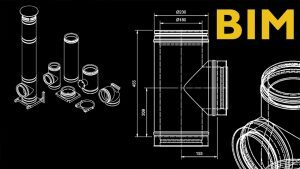 DM 44 is designed for inserts, stoves and small open fires. Available in 2 internal diameters, 180mm and 200mm. 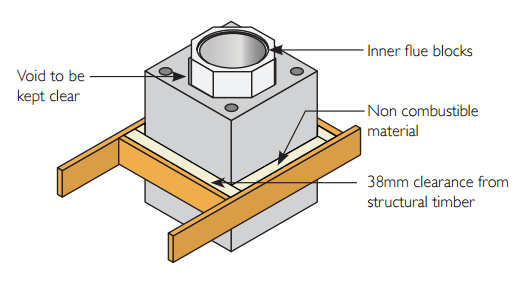 All inner blocks fit into the same external block. DM 54 for larger open fires and appliances. Available in internal diameters Ø300mm and Ø345mm. Both inner liners fit into the same external block size. Click the links mentioned below for details about a particular installations. 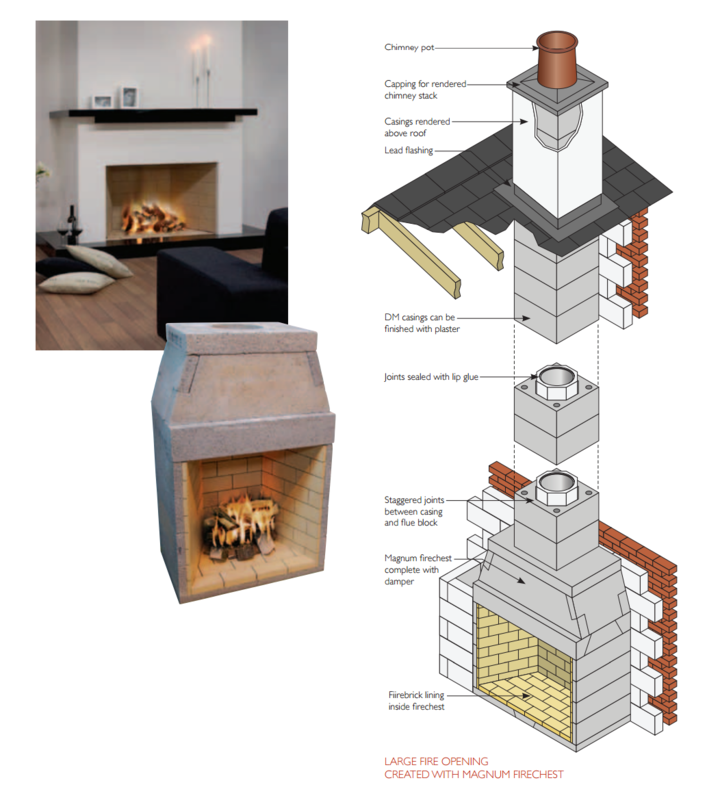 Bed the base plate of the firechest onto a suitable foundation/constructional hearth in accordance with Building Regulations and at the level required on site using Isokern Lip Glue. Install the firechest using lip glue making sure all elements are level. 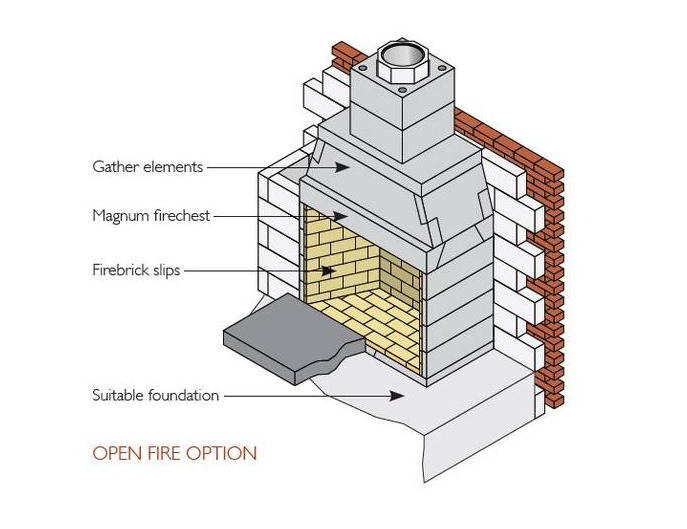 100mm of brick/blockwork must be built around the sides and back of the firechest to comply with Building Regulations. The inside of the firechest must be finished with a suitable fireback or firebrick slips. Install the gather using lip glue making sure all the elements are level. The front face of the gather can be finished with platerboard, rendered or clad in masonry. Lintels may be required above the gather to help carry the brick or blockwork. The maximum loading capacity of the ISOKERN firechest and gather is 2500kg. 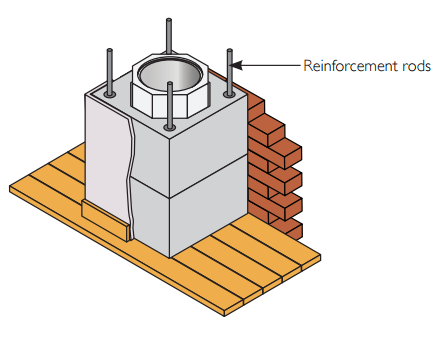 Pre-stressed lintels or a suitable cast-in-situ concrete slab must be provided above the stove recess,please make sure they are strong enough to carry the load(see appropriate Isokern DM drawing for aperture size). 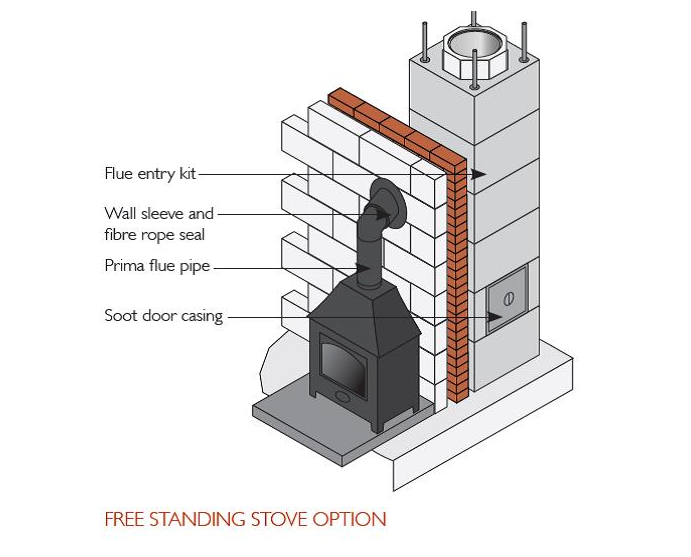 It is recommended to have a minimum of 600mm of stove flue pipe before connecting to the support block. The support block is bedded onto the lintels using a weak mix mortar. 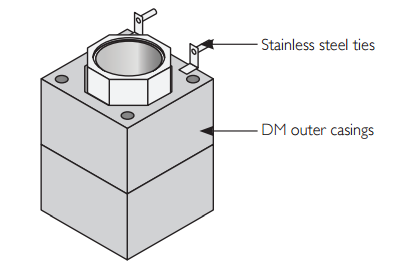 A stainless steel adaptor is used to create a positive connection from the support blcok to the stove flue pipe(fibre rope should be used to create a seal). 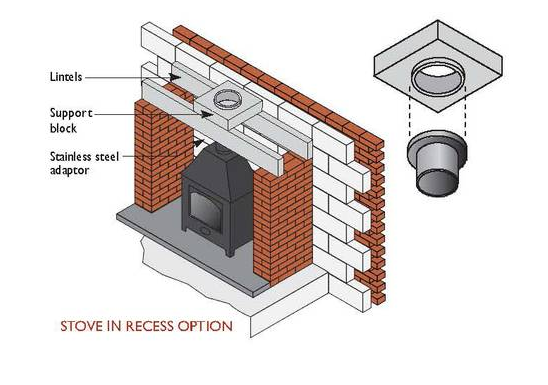 A soot door casing and access flue block must be used below the flue pipe entry. A suitable wall sleeve must be used to seal the cavity wall. Any combustible insulation within the wall must then be kept away from the single wall connecting flue pipe by at least 1.5 X its diameter. Fibre rope is used to seal between the flue pipe and wall sleeve , a suitable trim collar can be used to finish the inner wall surface. Bed the first outer casing using lip glue making sure the rebate (raised lip) is uppermost. The starter flue block is then put inside the casing bedded with lip glue. The socket on the starter flue block must be uppermost and the air gap between the starter flue and the casing should be kept clear. 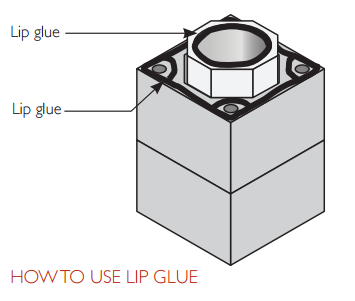 The finished lip glue joints should be 2-3mm thick, a special bag is provided for ease of application and the lip glue should be applied in 12-15 mm beads. Casings and flue blocks are added using lip glue for all joints. 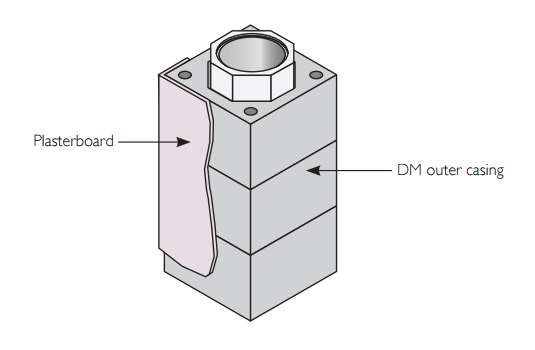 Ensure the air gap between the inner and outer casing remains clear. The outer surface of the casings to be finished with plasterboard on dabs or plaster. The side that faces the wall does not need an external finish. Offset blocks ‘if required’ must be used immediately above the support block or firechest gather. They must be glued together with lip glue and be fully supported. Please note a chimney should be built straight wherever possible. 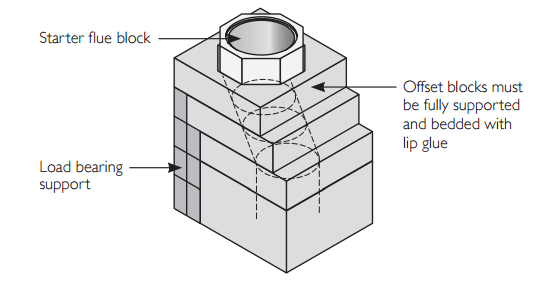 A starter flue block will be required above the offset blocks to stagger the joints between the outer casing and inner flue blocks . 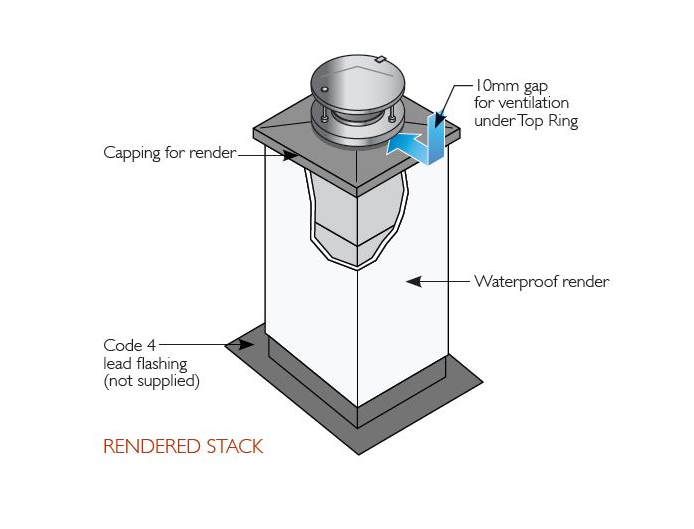 On a rendered stack with top ring fitted , where a straight chimney passes though a floor or roof, zero mm distance to combustibles can be applied. A sliding joint is made using mineral wool or similar non-combustible material. 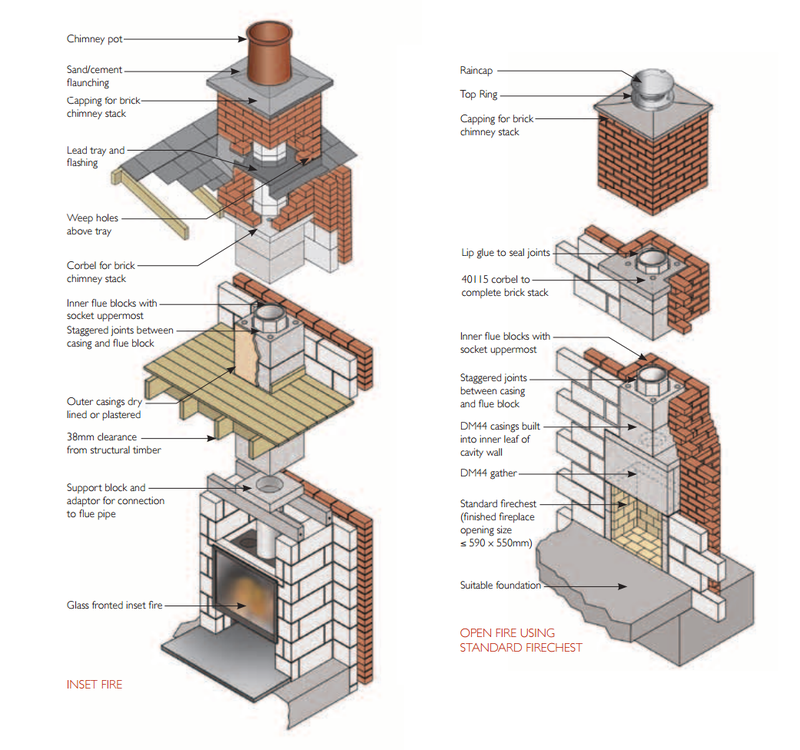 In all other cases ,38mm clearance must be maintained between the outer face of the chimney and any structural timber or loose combustible material . 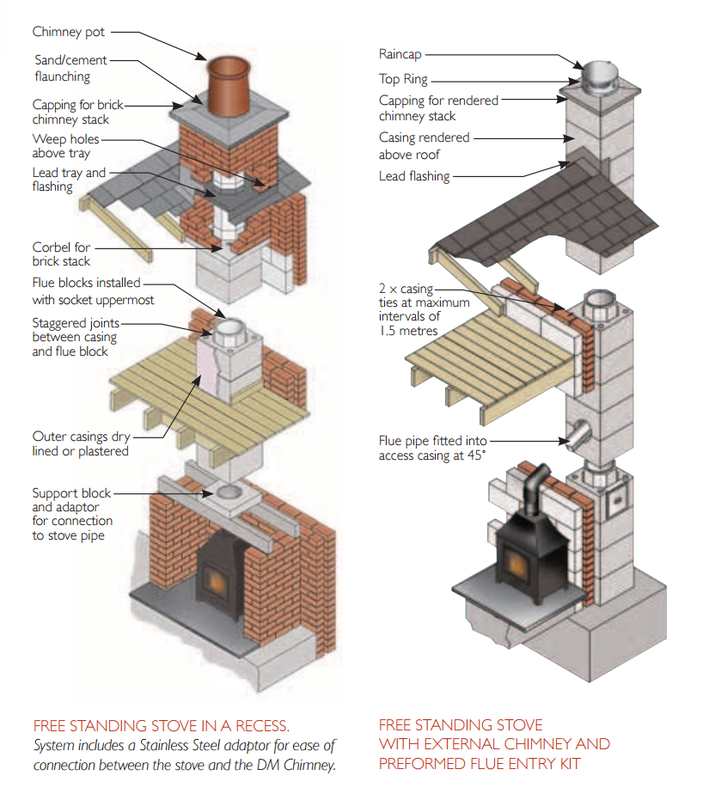 Floor boards ,skirting boards ,dado rails and other non -structural components may, however ,be in contact with the chimney. 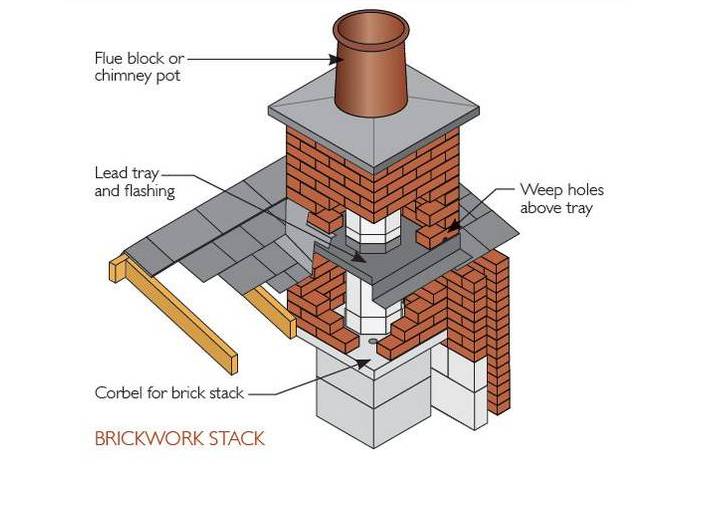 External chimneys must be tied to the structure at maximum intervals of 1.5 m and at the point where it departs from the roof using 2 x suitable stainless stell wall ties. These are fitted into the outer casing joints. They are not always required for internal chimneys .Please consult our team at the Isokern technical office. High tensile steel reinforcement rods will be required for all chimneys with a height that exceeds 1.4 m above the roof line, 1.1 m if the wind speed exceeds 44ms. 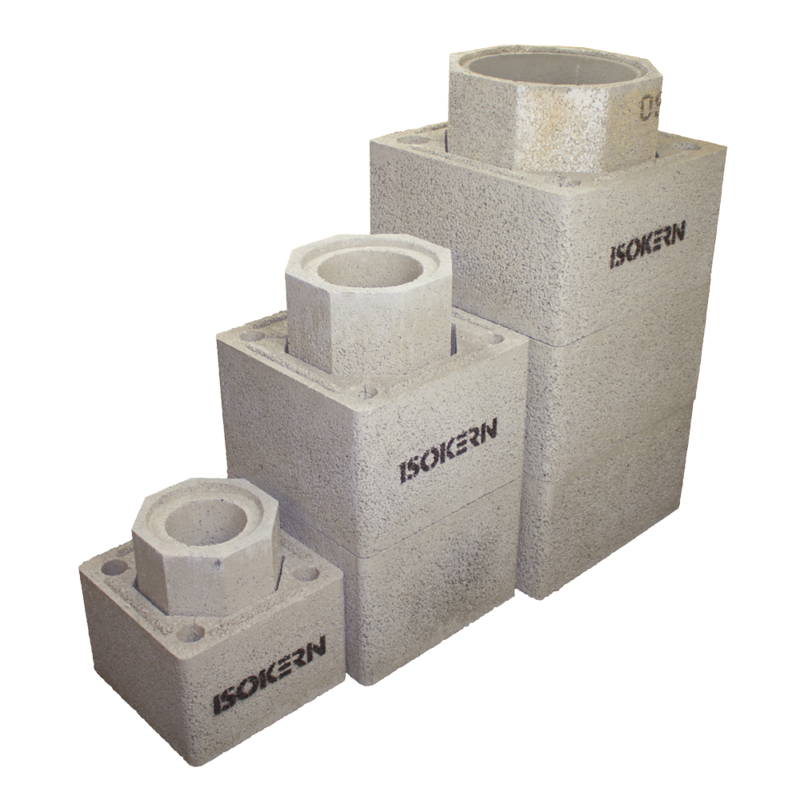 These rods are available from Isokern and must be grouted (1:3 cement/sand) into the holes provided in the outer casings. You must start the rods at least the same height below the roof as what’s above ,please check with our technical department. Code 4 lead flashing to be fitted at roof level as per Building Regulations. We recommend that you scorch a 5-10 mm deep channel into the outer surface of the casings and fold in the top edge of the flashing . Finish the outer surface of the casings above the roof with 2 part waterproof render. The recommended mix is 1:2:5-6 cement:lime:sand for the undercoats.1:2:8-9 cement:lime:sand for the final coat. The number of coats required will depend upon the degree of exposure, generally a two coat mix is acceptable. Isokern concrete capping for render to be lip glued onto the last casing . To take brick or stonework externally a corbel is fitted just below the roof. Code 4 lead tray with 50 mm upstands and stepped flashing to be fitted in accordance with Building Regulations . A 50 mm upstand should be fitted tight to the outside of the flue block and where possible turned in by approx 10 mm. Lead trays should be coated with bituminous paint where it is in contact with mortar. The D.P.C tray should be fitted at least 150 mm above the lowest point of intersection with the roof. Weep holes should be provided at the front of the stack above the tray for water drainage . Casings can be deleted above the corbel if stack height is less than 1.4 m above the roof. Take the last flue block up through the capping ,do not fill the gap between the flue block and capping. Push fit the aluminium top ring onto the flue block and make sure there is a 10 mm air gap between the outer edge of the ring and the capping . The flue block may need cutting to suit. This option always required a 38mm distance to combustibles from the outside of the block . Fit a chimney pot at least 75mm down into the capping and flaunch with 1:3 cement and sharp sand to seal around . This option is not possible if 0 distance to combustibles is required. A chimney notice plate must be completed and permanently fixed in the dwelling ,ideally near the electrical consumer unit. The checklist and notice plate are available from Schiedel Isokern. The chimney should be left for at least 72 hours before use , then start only with small fires for the first week and gently increase thereafter. The chimney should be swept at least twice a year ,once before the heating season and once after the heating season . You may need to sweep during the heating season depending upon use. Always follow the appliance manufacturer’s operating instructions. Always burn approved fuels or dry seasoned wood . Avoid burning unseasoned wood and slow burning of solid fuels as this can product excessive soot and condensation which in turn cause soot fires and damage. If correctly installed, operated and maintained these systems should last the life of the dwelling.